Based on motto "Practical Knowledge is everlasting" So we at Sun Valley follow the same i.e. learning by doing. All latest instruments related to electricity, sound, height and many more which enable them to get the concept of Physics. We have no. of Lenses, Mirrors, Magnets, Official benches, Sonometer, Potentiometer, Meter bridge etc. in our Lab. In general student to apparatus ratio is 2 : 1. Chemistry Lab is well equipped with all precautionary measures against any eventuality. Advanced network of gas connectivity is given for safe handling of the experiments. Our Biology Lab is well equipped with no. of specimens advanced microscope like compound and dissecting which enable students to understand basic anatomy of life forms. After visualizing specimen students correlate existence of biodiversity. We also have Haemometer and Haemocytometer by which students measure % of Hb ( Haemoglobin) in their blood and can count no. of RBC by preparing slides. Presence of human skeleton enables even small children to understand the concept of body movements. Theory of evolution is best understood by knowing anatomy of various specimens from lowermost plant algae to highly evolved angiosperms. Our teachers uses all these equipments mentioned above in their class rooms for explaining theoretical portions, Whereas in Labs main emphasis is given on self performance rather than demonstration from teachers. School has a well equipped S.S.T. lab. Lab is full of various 3D models, Charts, maps and many audio visual teaching aids which are used by teachers to enable the students to understand the geographical concepts in an interactive way. The lab also gives the students an opportunity to work independently on various projects assigned to them by teachers from time to time. 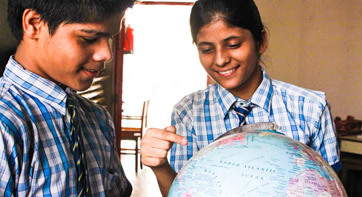 The students are encouraged to make working models and by doing so they have a clearer perception of the different geographical features of the earth. Maths lab is a place where learning becomes fun. 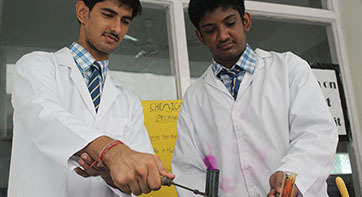 Students from classes VI to X have well planned activities here. 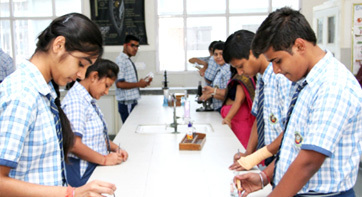 To facilitate and engage the students in a variety of hands on learning experiences the students & teachers have put together models in the laboratory. There are number of experiments with colourful paper cutout & paper folding activities which help to clarify concepts of lines, angles, triangles, quadrilateral & circles etc. for classes VI to X. 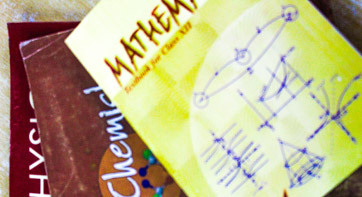 The Maths lab comprises of a variety of mathematical teaching aids in the form of models, games, chart, CDs etc. useful for effective learning for classes I to V. Reinforcement of concepts is also done by IT-based interactive teaching which is available in addition in our Audio Visual Room. 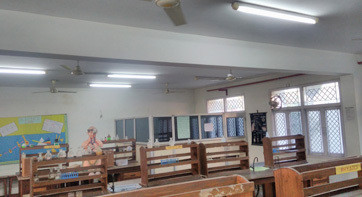 The school has an Audio-Visual Room equipped with Multimedia Computer with LCD Projector and white board technology (Smart Class), where interactive teaching of all the subjects through computer takes place. To support audiovisual Room activities, a large number of Audio/Video cassettes and CD-ROM's related to all the subjects, are available. The seating capacity of the hall is around 100. Subject teachers prepare their Lesson Plans and Lectures to be delivered to students, using the most recent software available. These lectures are then projected in the AV Rooms through an LCD projector to enhance the learning experience using Audio & Video effects. No educational institution can flourish without computers today. Therefore it is imperative that we incorporate computer education in our curriculum. We have computer based classrooms and a fully equipped Computer Labs. 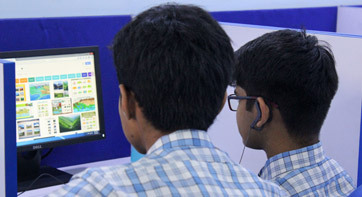 The School has two Computer Labs( Junior and the Senior) which are fully equipped with multimedia machines to provide the most advanced computer-aided education from 1st onwards. The Senior computer laboratory is connected with high speed Broadband connection for Internet Surfing under surveillance. Computer Science is compulsory from classes I to X. 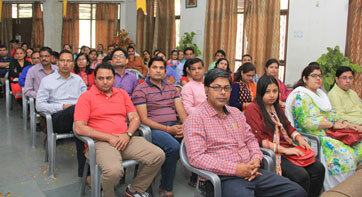 It is offered as an elective subject at +2 stages. 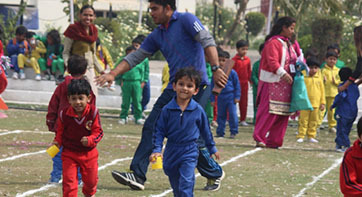 So we can say the ultimate objective is to develop an all round personality of the students so that they may become physically fit, intellectually alert, morally sound and emotionally well balanced. Our School has a splash pool, which is functional during the warmer months of the year i.e. generally from April to October. 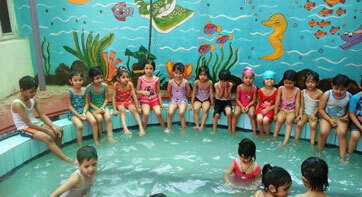 For recreation and enjoyment, Pre-Primary and Primary students are taken to the Splash pool regularly. 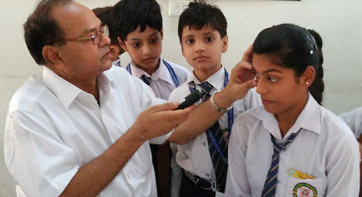 The School infirmary is fully equipped with medical facilities for check-up of students by a qualified physician on regular basis. We have a dispensary in school premises for handling emergencies during school hours. The drivers and conductors are well trained and connected to each other and the School by Cell phones provided to them. For proper functioning every route is given two teachers and route registers are maintained where teachers take daily attendance of the route students. The buses leave the School only after the route teacher checks that each child who ought to be in on the bus has actually boarded the bus. 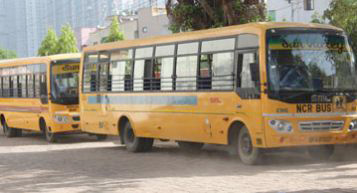 Sun Valley International School has fleet of Buses that go to all the nearby areas like Vaishali, Vasundhara, Indirapuram and some areas of Ghaziabad and Delhi.